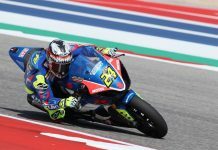 AUSTIN, Texas – Yoshimura Suzuki won its second straight race at the Circuit of The Americas on Sunday, but it wasn’t the one ridden by Saturday winner Toni Elias. 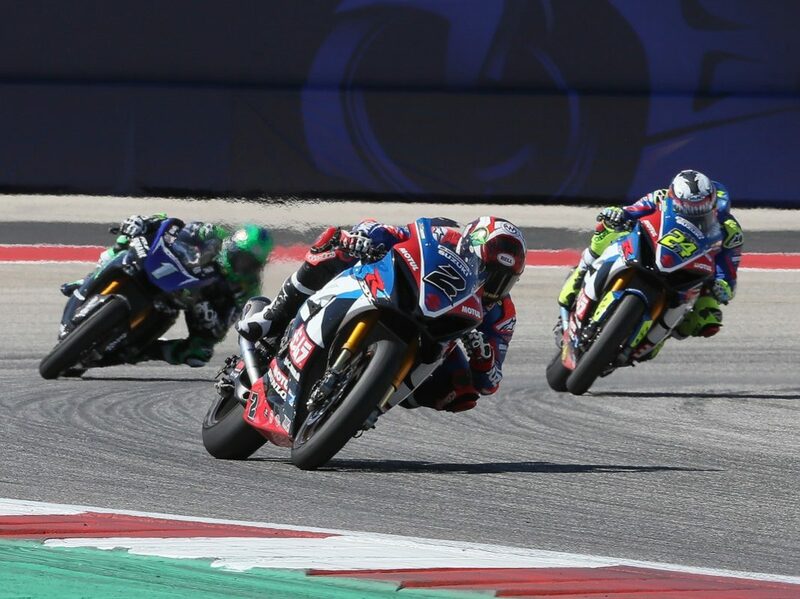 This time, it was Josh Herrin on the top step of the podium after winning the seventh AMA Superbike race of his career in the MotoAmerica Championship of Texas. Herrin battled for 13 of the 15 laps with his teammate Elias, with Monster Energy/Yamalube/Yamaha Factory Racing’s Cameron Beaubier always within striking distance. In the final two laps, Herrin was able to put his head down and crossed the line .958 of a second ahead of Elias, with Beaubier 1.6 seconds behind in third. “Mentally, I feel like I was a lot more prepared today,” noted Herrin. “We spent a lot of time at the track last night. We ran a different tire today, but it was two totally different weather conditions today, so I don’t think that really had much to do with it for us. Just made the right choice, I guess. It’s just been – every day I think I get more comfortable on the bike. Each time I can race it and actually put in those hard laps, I learn a lot. “It’s been such a crazy off-season. 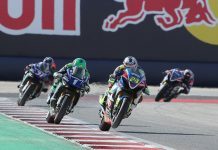 I had super highs coming into it and then, once the season started, I was bumming pretty hard because I just wasn’t riding like myself,” Herrin added. “I think I was just getting so excited at the beginning of the races that I was kind of blowing it for myself, riding like a rookie a little bit. I just had to kind of reset my brain and just relax a little bit. Toni set an amazing pace. I was able to keep up with him. I had to keep telling myself, don’t pass at the end of the straight. My bike was a missile today. Fourth place went to Beaubier’s teammate Garrett Gerloff, the Texan coming on strong at the end of the race to finish 3.2 seconds behind Herrin. Gerloff, in turn, was well clear of fifth-placed Jake Lewis on the M4 ECSTAR Suzuki. Omega Moto’s Cameron Petersen finished sixth, some three seconds ahead of KWR Ducati’s Kyle Wyman. 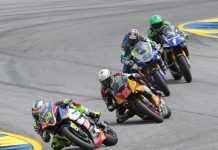 FLY Racing/ADR Motorsports’ David Anthony, Weir Everywhere Racing BMW’s Travis Wyman and Thrashed Bike Racing’s Max Flinders rounded out the top 10. Westby Racing’s Mathew Scholtz was 13th after getting the meatball flag that forced the South African to pit. J.D. Beach, meanwhile, crashed out of fifth place late in the race on the Attack Performance Estenson Racing Yamaha. With two rounds of the EBC Brakes Superbike Championship in the books, Elias has a 13-point lead over Beaubier, with Herrin moving past Scholtz and into third.